The single-story adobe ramble on the corner of Military Plaza (or that which is left, with Town Hall plunked down in the middle of it) is the oldest existing domestic structure in San Antonio, It dates from the 1700s; that period when Texas was a far-flung outpost of Spain, and the entire town was a huddle of similar houses around the margins of Military and Main Plazas. So – the Spanish part of the description is justified. It definitely wasn't a palace by any stretch of the imagination. But it was a vast improvement, living-situation-wise over a windowless, dirt-floored jacale-hut made by planting upright timbers in a trench and plastering them inside and out with mud, so on that basis it certainly looked enough like a palace to warrant a touch of exaggeration. Finally, it was a governor's residence only by extending the term to gossamer-thinness; it was originally built as the residence and place of business for whomever was captain of the local garrison. That captain of the garrison was the highest authority-figure around, year in and year out ... and long after Mexico won independence from Spain, and Texas won independence from Mexico, the sturdy adobe building survived, as the home of the family of the last garrison captain. When it was no longer a residence – as the area around became a lively commercial district – the rooms housed various enterprises; a pawn shop, a grocery store, a couple of saloons and a haberdashers. Little by little, similar colonial-era structures crumbled, or were demolished and replaced by newer and bigger shops and houses. The nearby Veramendi mansion on Soledad, from the same era and general plan, but built of stone, also followed the same arc. Once the home of the aristocratic family whose daughter married James Bowie, it descending from a grand residence to a variety of shabby businesses before being demolished in the first decade of the 20th century in order to facilitate the widening of Soledad Street. 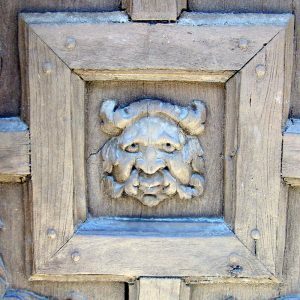 The Governor's Palace was luckier – in that it didn't stand in the way of any plans to widen streets, and that the conservation bug had settled in, well and truly. The city bought the place entire, and commissioned architect Harvey Partridge Smith to restore it to what it would have been like in its glory days. 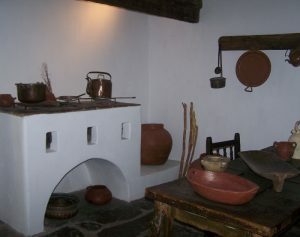 Smith used his knowledge of other similar buildings across the length and breadth of the Hispanic settlements in the Southwest, and so arrived at a romantic approximation rather than a strict interpretation. 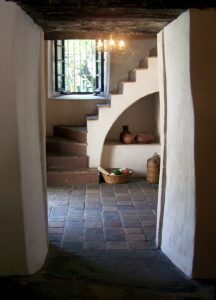 But it is a charming building even so, with thick walls and tall ceilings (as a sort of heat sink), long narrow windows opening into a Spanish-style courtyard and garden. 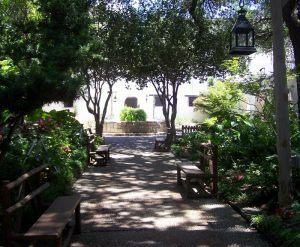 In the old days, the garden and outbuildings would have reached to San Pedro Creek. 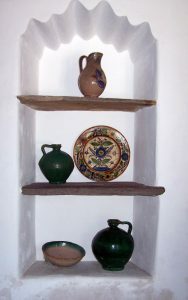 The floors are of tile, which would have been cool to walk on, and there are numerous niches cut into the walls and set with shelves for various ornamental items. Before the invention of air conditioning, this kind of building would have been about as comfortable as you could get, in the heat of a Texas summer. 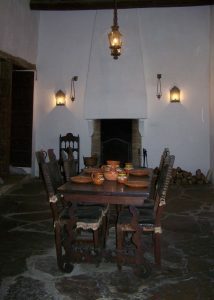 The Spanish Governor's Palace is open to the public various hours on every day but Monday, and is well worth a visit to gain an idea of how the upper elite would have lived in early San Antonio.